The August 2018 earthquake in Lombok resulted in 98 casualties and sent many locals in neighboring Bali scrambling for cover. That’s because a major faultline lies in the seas beyond Bali’s southern coast—making the island particularly vulnerable to tsunami. Kuta, Tanjung Benoa, and Sanur in South Bali are considered to be most exposed to the danger. All three areas are low-lying, tourist-saturated areas facing the Indian Ocean and the volatile Sunda Megathrust beneath it. 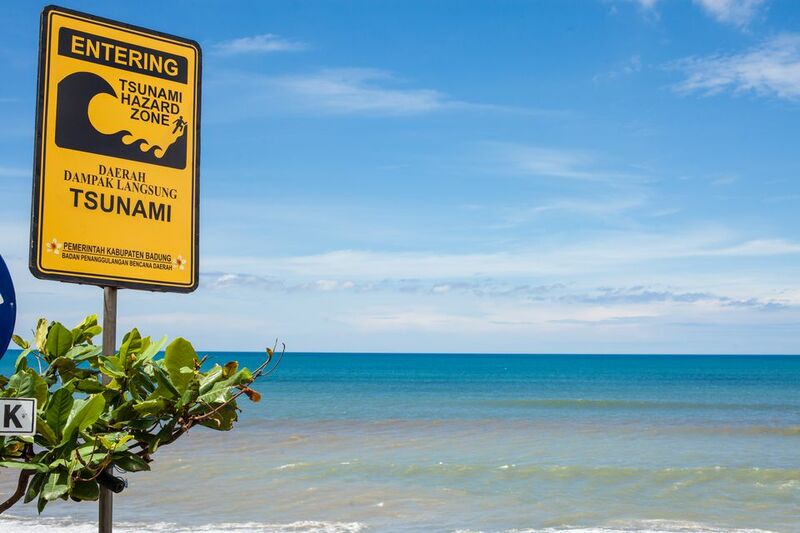 Should you find yourself in the midst of a tsunami warning in Bali, here's what you should know. To compensate for Bali's vulnerability to a tsunami, the Indonesian government and Bali stakeholders have set up detailed evacuation plans for residents and tourists based in these areas. The government's weather service, Badan Meteorologi, Klimatologi dan Geofisika (BMKG) runs the Indonesian Tsunami Early Warning System (InaTEWS), instituted in 2008 in the wake of the Aceh tsunami event. Complementing government efforts, the Bali Hotels Association (BHA) and the Indonesian Ministry of Culture and Tourism (BUDPAR) coordinate with the Balinese hotel sector to promote the "Tsunami Ready" evacuation and protection protocol. Read their site: TsunamiReady.com (English, offsite). At present, a siren system is in place around Kuta, Tanjung Benoa, Sanur, Kedonganan (near Jimbaran), Seminyak and Nusa Dua. On top of this, certain areas have been designated as red zones (high-risk areas) and yellow zones (lower likelihood of being swamped). When a tsunami is detected by the Center for Disaster Mitigation (Pusdalops) in Denpasar, the sirens will sound a three-minute wail, giving residents and tourists about fifteen to twenty minutes to leave the red zones. Local officials or volunteers are trained to direct people to evacuation routes, or if reaching the higher ground is not an immediate option, to the upper floors of designated evacuation buildings. Hotel staff will guide guests to the proper evacuation areas. If out on the beach, proceed west to Jalan Bypass Ngurah Rai. In Sanur, all areas east of Jalan Bypass Ngurah Rai are considered "red", unsafe areas for a tsunami. If you have no time to proceed to higher ground, seek refuge in buildings with three floors or higher. A number of hotels in Sanur have been designated as vertical evacuation centers for people who do not have time to evacuate to higher ground. Guests staying at Kuta should proceed to Jalan Legian or to one of Kuta/Legian's three designated vertical evacuation centers when they hear the siren wail. Hard Rock Hotel, Pullman Nirwana Bali and Discovery Shopping Mall have been designated as vertical evacuation centers for people in Kuta and Legian who do not have time to evacuate to higher ground. Areas west of Jalan Legian have been designated as "red zones", to be immediately evacuated in the event of a tsunami. Kuta Alert: Red zones, yellow zones, and more information on Kuta tsunami evacuation can be found online. Prepare yourself for the worst: If you are staying at one of the vulnerable areas mentioned above, study the attached evacuation maps, and familiarize yourself with the escape routes and the direction of the yellow zone. Cooperate with your Bali hotel: Ask your hotel in Bali for the tsunami preparation procedures. Do participate in tsunami and earthquake drills, if requested to by the hotel. Assume the worst when an earthquake strikes: After an earthquake, move away from the beach immediately without waiting for the siren, and head for the designated yellow zone in your immediate vicinity. Keep your ears open for the siren: If you hear the siren sound a three-minute long wail, head immediately for the designated yellow zone, or if that is impossible, look for the vertical evacuation center closest to you. Check broadcast media for tsunami updates: The Bali local radio station RPKD Radio 92.6 FM (radio.denpasarkota.go.id) is assigned to send tsunami updates live on the air. National TV channels will also broadcast tsunami warnings as breaking news. Check social media, too: The BMKG government office issues regular updates on their official Twitter account, and via apps for iPhones and Android devices.